Saturdays usually means one thing - Saturday Night Pizza Parrrttty! If you didn't know, pretty much everyone in this household loves Pizza, however since January it's become more of treat than a weekly indulgence and so we are having a Saturday Night Pizza Party! However our pizza party is going to be different from the normal cheeky takeaway or picking one up on the food shop, we have decided to make more of an effort and make our own, Great British Bake Off I blame you and your Italian week! So since we have decided to have a go at making pizzas we made everything from scratch; the dough, the sauce, the toppings and even fresh chicken. I cannot actually remember the last time that I made a pizza from scratch, it's got to be around year nine or ten at school and that was many moons ago now. So we decided to see if our culinary skills are up to scratch and make our own family pizzas. I can't ever remember having this much fun tossing pizzas and watching our daughter have fun trying to toss a pizza and having a meltdown because it broke, we've had a lovely evening so far. Fancy making your own? 1. Put the flour, yeast and 1 tsp salt into a large bowl. Stir in 500ml of slightly warm water and the oil, making sure the scrape down the sides of the bowl of the mixture, cover with a tea towel. Leave dough to rise or until doubled in size. 2. When ready to cook, bring the dough to room temperature. Heat the oven to 220C/200C fan/gas 7. Dust 2-4 baking sheets with semolina. Dust the work surface with flour, then divide the dough into 2 or 4 pieces. Knead each piece on the floured surface, incorporating enough flour to stop the dough being sticky. 3. Roll each piece into a pizza shape and lift onto baking sheets. Leave to rise for 10 mins while you sort toppings; we added green bell pepper, red onion, chicken, sweetcorn and pepperoni. Top the bases with your chosen ingredients, drizzle with olive oil, sprinkle with salt and bake around 12-15 minutes or until the crust is crisp and the topping is bubbling. My husband made the sauce for our Saturday pizza party, but we added a small tablespoon of barbecue sauce to make it that little sweeter for us. However if you're more traditional stick with a tomato based sauce. 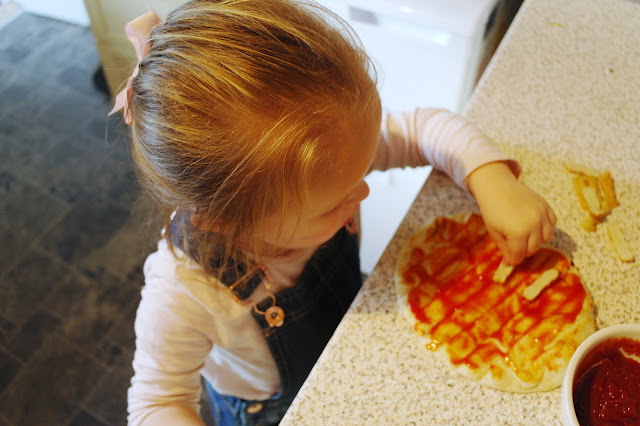 Our daughter couldn't wait to get involved with pizza making and as soon as we got her step out to reach the counter she was more than happy to get creative with her pizza, with encouragement to show some flare from Daddy. Once she put her toppings on her pizza, we popped hers into the oven for ten minutes or so. Then we started adding the toppings to ours we included an array of vegetables: green bell pepper, fresh tomato, mushrooms, sweetcorn, onion with chicken pepperoni not forgetting mozzarella. Yummy! After fifteen minutes in the oven our pizzas were ready and we were all too excited to see how they tasted! AMAZING! These ones tasted so much better than ones at the takeaway! It's the perfect end to another great Saturday. Do you ever have pizza party on a Friday or Saturday night? 2 comments on "SATURDAY NIGHT PIZZA PARTTTYYY"
Nice Share. Sounds Like a fun time.